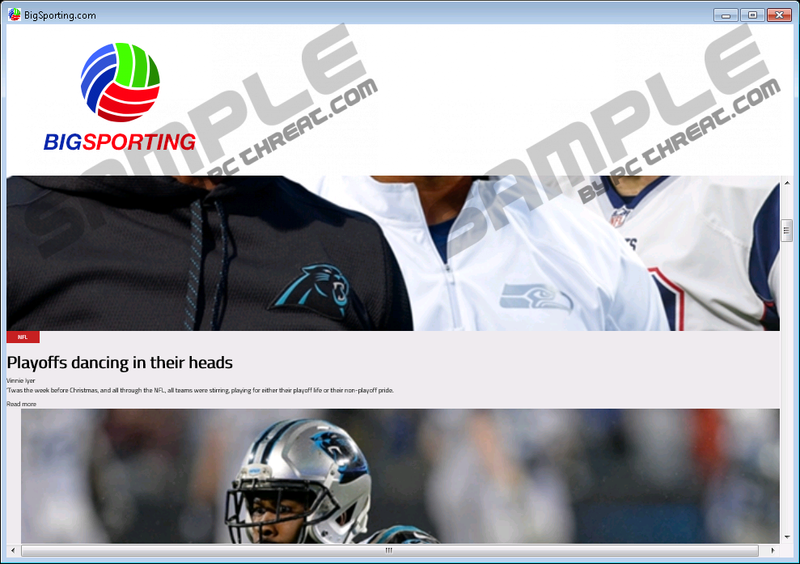 BigSporting promises you sports news feed available from your desktop, but we have found that this application is simply a new clone from an annoying adware family that includes DatingDone, WeatherGrind, and DraftFactor. This ad-supported application can pose a threat on several fronts for your computer. For starters, even its own official downloader reminds us a malicious bundle packed with a number of malware threats. How reliable a program can be that brings along browser hijackers, adware applications, and potentially unwanted programs on board. Most probably they do not just ride along for a sightseeing tour on your operating system. Unfortunately, the sad truth is that all these infections may expose you to harmful third-party web content. So before you fall into the trap of thinking that if you remove BigSporting, your computer will entirely secure and clean, let us tell you that when you want “clean,” you need to do more than that. Carry on reading to find out more about this infection and how you can avoid similar threats. Visiting the promotional website of this useless application (bigsporting.com) could be a risky challenge. Security tools detect this page as a potential threat and they do not even let you load it. This should tell you just enough about the reliability of BigSporting. However, if your PC is not protected, you may well be able to load this page and even download the installer. You need to be careful on this page because you will be exposed to third-party advertisements which could be risky to click on. If you download the installer offered here, you will be surprised to find a number of malware threats on your computer. As a matter of fact, we have seen Hostify, AdBeaver, and Search.yourmovietime.com among others travelling in this bundle. We have also noticed that these malicious applications may be different as time passes and due to location as well. But what is certain is that your computer will be infected with adware programs, browser hijackers, and potentially unwanted programs, if you install this program. We have just started our analysis, but you should already have enough reasons to delete BigSporting if you are a security-minded person. But let us go on because this is really just the beginning. The truth is that this sort of “official” way seems to be less likely the way your computer has been infected with this adware. Reports show that this application can appear on your computer in a number of alternative and even more questionable ways. For example, it is possible that you click on a link or an ad on a modified search results page. How is that possible? Well, when your PC is infected with a browser hijacker, it is easier that you may think. Another common option is to click on an infected third-party ad, such as a pop-up download offer. This can happen if there is an adware program active on your system or you are visiting a suspicious file-sharing or P2P website. We suggest that you steer clear of torrent, freeware, and pornographic sites as well as clicking on advertisements. Nevertheless, we have found that there is no doubt that if you find this adware on board, you will also find a bunch of other infections. There is really nothing else you could do; you need to remove BigSporting and all the rest as well. When you launch this desktop application, it opens a window and loads sports news-related websites, such as instagram.com/sportingnews. We have found that these websites are rather lame or not really worth checking at all, not to mention the fact that this adware may inject third-party ads in these pages, which could put you at risk. At the same time this application may also open an Internet Explorer window with advertising, offers, and survey-related websites, such as redtag-specials.com/?agent_ID=201735&campaign_ID=6089. These pages may also present to you unreliable web content. We recommend that you use your preferred browser if you want to check sports news or use a reliable tool, such as a toolbar. If you engage with any content this adware may offer you, it is possible that you end up on a questionable website or worse, a downright malicious one. It is easy to infect your computer with more malware programs or even reveal your banking details or other sensitive personal information to cyber criminals if you land on unfamiliar fake websites. We do not suppose that you want to experience any of these scenarios. That is why we advise you to delete BigSporting ASAP. We can offer you two effective methods against this adware. You can remove BigSporting simply by uninstalling it via Control Panel. You can do this even if you are an inexperienced computer user. If you need assistance, please refer to our guide below. If you are a more advanced user, you may want to manually clean up the mess this application caused. Please find our manual removal guide below, too. Keep in mind that this option involves Windows registry modifications; therefore, utmost care is needed. As you can see, it is quite easy to let a number of threats onto your computer in one go. You need to be careful all the time you go online. But even if you visit only reliable websites, do not click on any suspicious content, and do not open e-mails or attachments coming from unfamiliar senders, it is still possible to make a mistake and end up in the center of a malicious attack. Therefore, we suggest that you use a professional malware removal application to protect your virtual world. Press Win+Q and type in regedit. Click OK.
Quick & tested solution for BigSporting removal.